The Buddha ‘s teaching are contained in an immense number of sutras , treatises, and commentaries, making it a daunting task to acquire an integrative understanding of Buddhist philosophy and practice. In the Core Teachings, Venerable Master Hsing Yun outlines and explains the central concepts and practices in simple languages. And accomplished scholar of Buddhism ,Venerable Master Hsing Yun illuminates these complex concepts with insights from decades of practice. 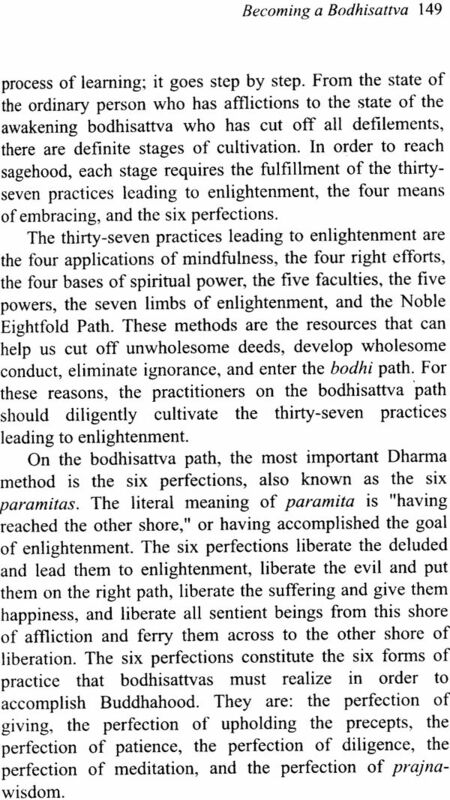 A clear and accurate understanding of the core of the Buddha ‘s teaching s is essential for putting them into practice and progressing on the path of enlightenment. 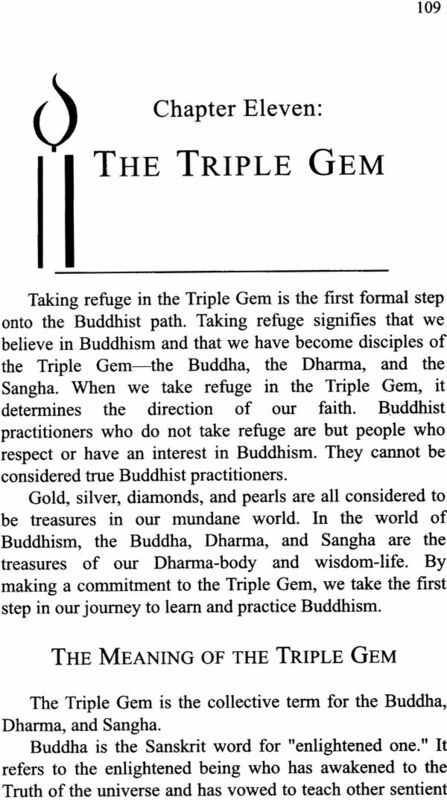 The Core teachings is a precious jewel for beginners and advanced students of Buddhism alike. Founder of one of the world’s largest Buddhist organization , the Fo Gaung Shan Buddhist Order , Venerable Mater Hsng Yun has dedicated over fifty years to teachings and promoting a “Humanistic Buddhism” that integrates Buddhist spiritual practices into daily living . A Prolific writer , Hsing Yun has written numerous books aimed at guiding practitioners towards attaining true mindfulness and real awakening in life . His works have been translated into various Eastern and Western languages. Venerable Master Hsing Yun was born in Jiangdu , Jiangsu Province , China, in 1927. Tonsured under Venerable Mate Zhikai at age twelve, he became a novice mink at Qixia Temple , a mountain monstery in Nanjing, China. After arriving in Taiwan in the Spring of 1949, the Ven. Master became the chief editor of life journal, Awakening the world , Buddhism Today , and a host of other publications. In 1952, While at Leiyin Temple in Ilan , he established chanting groups, student and youth organization , a children’s Sunday school, and various Dharma teams that eventually laid the foundation for his future efforts in Buddhist propagation. Over the years, the Ven . Master has been recognized with numerous awards .In addition to the highly acclaimed honours received in his home country , the Republic of china, the Ven . Master has also gained international attention for his selfless dedication and contributors . He is the first person from the Roc. To be granted an honorary Ph. D. by the University of Oriental studies in 1978, and was awarded the Buddhist Gem Awarded by the Indian National Buddhist Assembly in 1995. In may of 1997, Taiwan ‘s Ministry of contribution to society , his country , and Buddhism at large . In Ordination Ceremonies along with the five precept and Bodhisattva precept ceremonies in Bodhgaya, India to restore the there vada bhiksuni precepts, which had been lost for over a millennium. On April 8, 2998, he accepted the Buddha’s tooth relic which he personally escorted from India to Taiwan where it would remain . The Ven. Master ‘s contribution toward Buddhism in truly Phenomenal and has helped society gain a better understanding of Buddhism a amidst current trends of institutionalization, modernization , humanism, and globalization. For more information about the life of venerable master Hsing Yun, please see Handling Down the light and bright star , Luminous clouds by Fu Zhiying. In my many travels around the world, I have often been asked the question: “Master, We want to develop our faith in Buddhism, but there are so many books about it. Which book should we read to gain a comprehensive understanding of Buddhism?” Faced with this question, I have simply did not know how to answer. 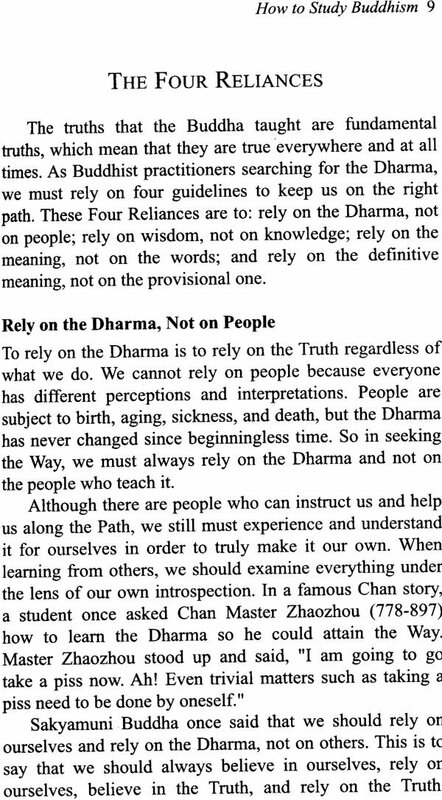 Since the budha ‘s words were first written down, the volumes of works based on his teachings have grown astoundingly. The Tripitaka alone has more than nine thousands volumes, with several dozen version in sanskrit, Pali, Chinese, and Tibetan . Contemporary Buddhist works are similarly daunting in number . Even if one devotees his or her entire life to studying them, one many may not be able to fully comprehend their essence. Within this immense body of Buddhist literature, findings a single book that is representative of the teachings, and can help ordinary readers gain an integrative understanding of the Buddhist conceptual framework , is truly not an easy task. 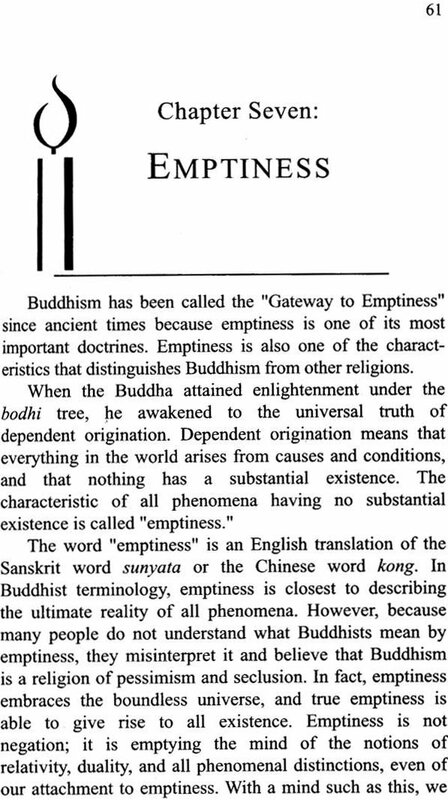 I believe that one obstacle t the spread of Buddhism is the sheer quantity and complexity of the Buddhist sutras. 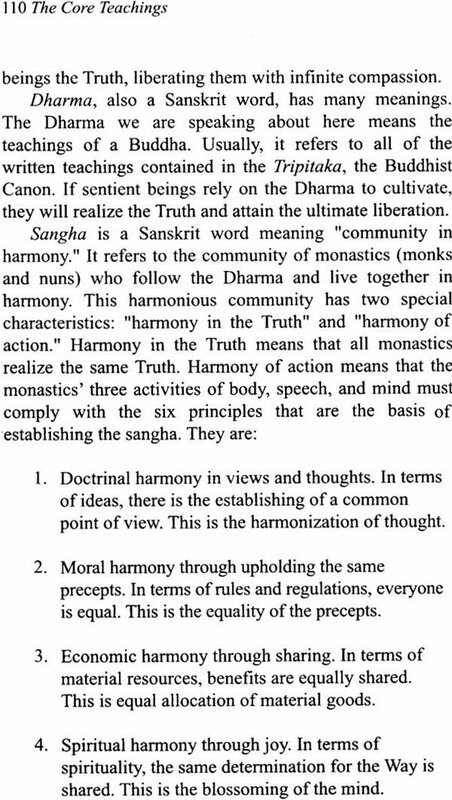 Those who are genuinely interested in learning more about Buddhist teaching s cannot come to a systematic , organized, and logical understanding of the Dharma From one specific Buddhist work. In contrast, Jews base their faith in the Hebrew Bible while Christmas base theirs in the Christian Bible, and both religious have maintained their beliefs through these books without doubt for thousands of year . Muslims have held onto a single Koran, and are even willing to sacrifice their lives for it. On the other hand, due to the daunting volumes and complexity of the Buddhist sutras, it is often difficult for Buddhist t discern which path to take in order to enter the gate of the Dharma. Consequently , some people stop taking steps on the path because of the difficulties they encounter when trying to understand Buddhist concepts , and some , standing outside the gate , dismiss Buddhism as a superstitious religion . Even among long time devotees and monastics, many are still unable to enter deeply in to the Dharma, let alone the readers who are just beginning to study Buddhism. With this I mind over the years, I have attempted to draft a series of books outlining Buddhist concepts teachings for the study of Dharma teachers and students at fo Gaung Sahn . In This process, efforts were made to prevent them from being either too lengthy or too brief , and to keep the languages simple and clear . During the past several years, many people have devoted their time and energy to help review, revise, refine , and translate these works into a series for readers in the West. It is my sincere wish that this work would help readers gain a more comprehensive understanding of the Dharma. I hope this books, and the following books in this series, will be able to realize this wish and benefit all sentiments beings. Buddhism originated in India over 2,500 years ago and has spread throughout most of Asia where it has had a tremendous influence on religion, Culture, philosophy, and psychology . Within the last century , its popularity has spread to the West, particularly Europe and the United states. It has had an impact on the fields of psychology , philosophy , and neuroscience, discipline that address the study of the mind meaning of existence. Buddhism is the name given to the practice of the teachings of Sakayamuni Buddha. The Sanskrit word. 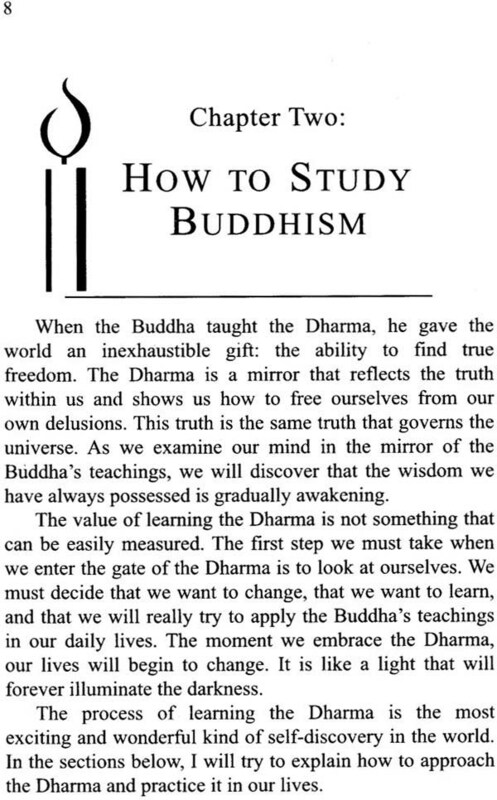 Buddha means the “ enlightened one” or “awakened One” and refers to those who have awakened to the truth. The historical founder of Buddhism was Siddhartha Gautama, who came to be known as Sakyamuni Buddha upon his complete enlightenment. 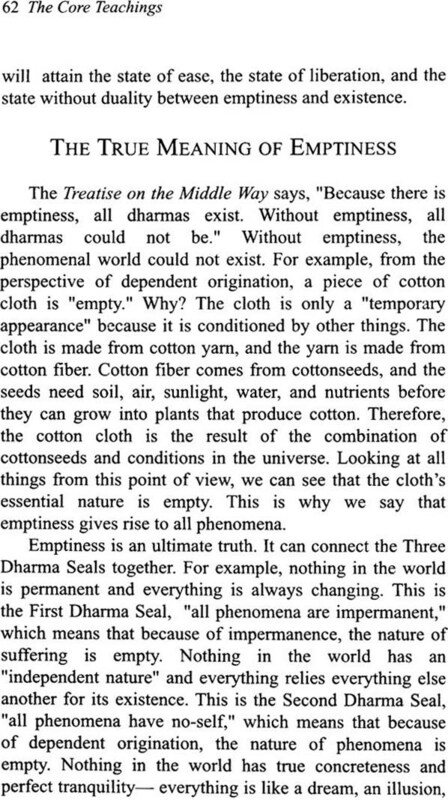 His teaching on seeing the truth of life and awakening to one’s true nature are as relevant today as they as they were in the Buddha’s time . However , before we discuss the teaching of the Buddha in Depth, let us look at the life of the man whose quest for truth continues to be the model for those seeking an end suffering. Before Sakyamuni Buddha was born on earth and became a Buddha for the sake of all sentient beings , he spent countless lives as a bodhisattva diligently practiced and cultivated, preparing the way to Buddhahood. While still a bodhisattva, lived in the inner curt of Tusita Heaven, the “heaven of the contented ones.” Where all bodhisattvas who will become Buddha in their next lifetimes reside. There, he waited for the conditions to be right among sentiments being to appear on our world as the Buddha. When the conditions for rebirth were ripe , the Bodhisattva entered the womb of his earthly mother, Queen Maya. I was around 500 BCE when the bodhisattva took his final rebirth. The kingdom of Kapilavastu , in presents – day southern Nepal, was ruled by a warrior clan called the sakyas, and hi s mother , maya, was a princess of Devadaha. At the end of spring , on the eight day of the fourth Lunar month, a prince was born in Lumbini Garden . It is said that in the moments after his birth, he took seven steps and, with one hand pointing toward the sky and the other pointing toward the earth , said, “This is my final rebirth in this world . I have appeared in this world to become a Buddha. I will realize the Truth of the universe. I will liberate sentiment beings everywhere. “ the prince was named Siddhartha , which means “accomplishing all. As was the custom, King Suddhodana summoned the most learned of wise men to foretell his son’s destiny. One of the Prince’s first visitors was a renowned sage named Asita who predicted that Siddhartha would become a great king of the world if he remained a layperson , or he would become a Buddha who liberates sentient beings if he renounced. On the seventh day after Siddhartha’s birth, Queen maya died. Her sister , Queen Mahaprajapati, lovingly raised the child as per her own. From an early age , it was quite evident that the Young Prince was extremely bright and that he excelled in all things. By the times Siddhartha was twelve years old, he was already an expert in the five studies and the four Vedas. In addition to his abilities in a wide range of scholarly subjects, he was also an adept warrior who was skilled in the material arts. The Prince grew into a Young man who was greatly admired for his strength, intelligence, dignity , and beauty. When Siddhartha reached marrying age , King Suddhodana arranged for his son to take a wife . Yasodhara, the beautiful daughter of a Sakya nobleman ,, was chosen . Many years of wedded happiness followed, and in Siddhartha’s twenty-nine, year, his wife gave birth to their son Rahula. All this time , King Suddhodana feared that Prince Siddhartha might leave the palace and his royal position . To prevent his son from renouncing , King Suddhodhana sheltered the prince from the world by building him special palaces and surrounding him with the pleasures of beautiful women , Music , wine , and other luxuries. Nevertheless, these worldly pleasures of the could not satisfy the feelings of loneliness that had crept into the Prince’s Heart.